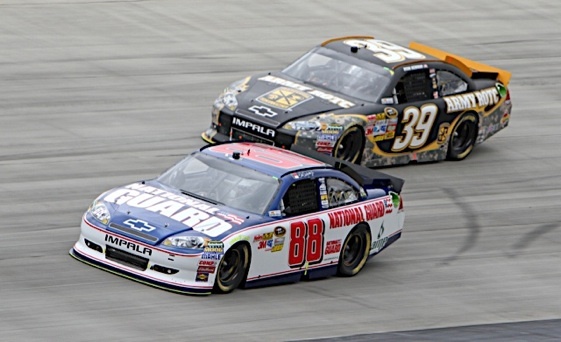 Dale Earnhardt Jr.’s championship chances probably went down the drain with last Sunday’s 24th-place finish at Dover. The lackluster run dropped Junior two spots in the standings, to 10th, and with only seven races to go that’s too deep a hole from which to climb. It would require a miracle for Earnhardt to get back in contention, and as the Junior Nation knows, miracles have been in woefully short supply in recent years. Granted, under NASCAR’s new system Junior is only 34 points out of first place. But it’s not the points but the positions that matter. If Junior was 34 points in second place behind co-leaders Kevin Harvick and Carl Edwards he’d have a shot. But he’s not only behind Harvick and Edwards, he’s also behind Tony Stewart, Kurt Busch, Jimmie Johnson, Brad Keselowski, Matt Kenseth, Kyle Busch and Jeff Gordon. Two or three might stumble down the stretch. Maybe even four or five. But not all nine. All nine drivers ahead of Junior aren’t going to fold during the next seven races. evidence that he and his team are capable of putting together seven straight powerful runs that would be required for them to make biggest comeback in NASCAR history. That’s why – as unpopular as it may be to write off NASCAR’s most popular driver – I don’t see any realistic hope for Junior’s first Cup championship. At least this season he showed some promise. Earnhardt hasn’t won a race but at times he has been in contention. And at least he made the playoffs, even if his Chase chances were short-lived. But it continues to be puzzling why Junior, driving for the best operation in NASCAR, hasn’t been able to produce results similar to his Hendrick Motorsports teammates. This season Mark Martin was odd man out, failing to make the Chase while Junior got in, but that’s small consolation when Earnhardt’s performance is compared to teammates Johnson and Gordon. Both have won, both made the Chase, and after three races both remain in title contention – Gordon just barely. That leaves Junior third-best in a four-driver operation. It will be interesting to see how Kasey Kahne fares next season when he replaces Martin in the Hendrick fold. Will he be able to take advantage of the opportunity any better than Earnhardt has? I don’t want to be too hard on Dale Jr. I was a long-time friend of his father’s and I’ve followed Jr. since he was a tyke. I’ve always been impressed by the way he has handled himself on and off the track. He’s great for the sport, win or lose, and I know how badly he wants to live up to expectations – his and his fans’. But for whatever reason it hasn’t happened. Not in the past, and so far not this season. 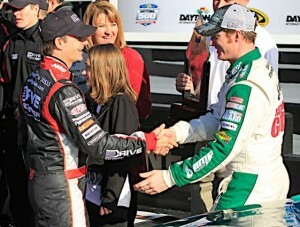 Once again it appears that Earnhardt and the Junior Nation will have to wait till next year. Trevor Bayne even won a race for crying out-loud. Oh he had a good season compared to most “average” drivers but average don’t win championships. Unless Nascar changes some kind of rules to benifit only Earnhart, then he will never be in contention. He does not seem to have the drive that most have for the championship. Don’t blame Jr. Blame his fans for putting undue pressure on someone that is not that good. Just average. Lackluster run? Did you forget to mention that he had two blowouts at New Hampshire? Or the fact that his front sway bar fell off at Dover? And that he had to pit at Dover for a loose wheel? The only thing that has kept Junior from running top ten all year has been equipment failure. Do a little research for God’s sake. Although Jr is now 10th in points how can anyone call the year a failure? There are at least 33 drivers behind him that would love to be where he is and there are a lot of good drivers in that group of 33. Looking at the past couple of weeks, flat tires, broken parts and a loose wheel, how exactly is that the drivers fault? Sure the chances of Jr winning the cup this year are almost gone but if there are no mechanical problems I dint see why he cant finish at least in the top five and if you dont win the cup 5th is as good as 2nd. Sure hope MATT OR JEFF CAN TURN IT AROUND…ONE WIN MIGHT HELP JR????? And you expected anything different from Jr.? We keep hoping he will turn out be to somebody, but alas, it doesn’t happen no matter how hard NASCAR tries. If his last name wasn’t Earnhardt, he would be lucky to be racing lawn mowers at the county fair grounds. Oh boy! Another “if his name wasn’t Earnhardt” type of comment. Dude, he’s won 18 Cup races. If his name wasn’t Earnhardt, then most people would think that he’s had a pretty good career. You sound like an idiot.